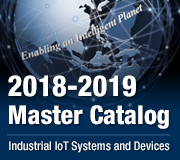 For successful Industry 4.0 implementation, intelligent factories need to utilize big data analysis, which is based on edge intelligence that collects data from all devices in a network and aggregate it in a cloud platform that offers powerful processing, storage, computing, and display capabilities. Evidence of this can be seen in equipment fault diagnosis applications. Traditional equipment maintenance management relies on experienced staff to identify potential problems and arrange repairs when equipment becomes out of order. However, because there’s typically a lot of equipment scattered throughout a factory, it’s difficult to be precise and targeted. Fortunately, through careful monitoring and diagnosis using a cloud-based system, management not only knows about the status of every machine and piece of equipment, they can take all the necessary steps as soon as possible to eliminate issues before problems occur. They can also perform defective equipment scans by analyzing historical data so as to improve detection rates, increase equipment life spans, and reduce production line down times due to equipment failures. A world-renowned steel corporation in Taiwan is a company that attaches great importance to IT innovation and applications that improve manufacturing efficiency. The company produces many kinds of steel products (including steel plate, steel bar, hot-rolled products, cold-rolled products, etc. ), and have been recognized by customers at home and abroad as leaders in the fields. Since these steel products need to be processed through more than a dozen procedures such as raw material processing, iron making, steel making, and rolling, factory staff have to maintain and manage a wide range of machines and equipment within hundreds of hectares of factory space. As a result, there have always been problems due to lack of maintenance personnel on the production line. So, the company wanted to use a cloud-based system that utilized big data analysis techniques to help automate things and make up for any manpower shortages. They wanted to use a cloud-based system for equipment monitoring and diagnosis and decided to first implement the new system in the cold-rolled workshop with hundreds of pieces of equipment. The company intended to build an equipment monitoring and diagnosis cloud platform system that could remotely monitor the status of their equipment and send data back to the machine learning application in the cloud for big data analysis. This would then create a predictive maintenance model for defect detection and preventive diagnosis. Accordingly, choosing a bottom-to-top private cloud solution that includes software/hardware implementation and cloud services was the most economical way to complete the project in the shortest possible time. The new solution needed to be scalable, allowing more devices to be included in the future and had to provide functions for data consistency, individual machine training, exception handling on the edge, data visualization, data acquisition/edge device monitoring, and more. Advantech's private cloud platform system is an edge-to-cloud total solution. It integrates both software and hardware products, including an intelligent box computer edge device, WISE-PaaS/RMM remote device monitoring and management software, WISE-PaaS/EnSaaS platform for IoT cloud services, WISE-PaaS/Dashboard data visualization tool, and WISE-PaaS/OTA for remote software update management. On the ground, the smart box computer connects to vibration sensors to collect equipment data in the cold-rolled workshop, and then uploads it to the cloud database. In the cloud, the platform created by WISE-PaaS/EnSaaS integrates with hundreds of smart boxes and provides information to the app designed for users. WebAccess/SCADA and WISE-PaaS/RMM are responsible for monitoring and managing all equipment and devices in the private cloud, and WISE-PaaS/Dashboard and WISE-PaaS/OTA facilitate system maintenance and management. 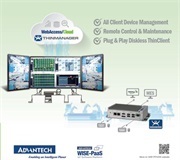 The new equipment monitoring and diagnosis cloud platform system is highly scalable and stable because it is built on Advantech's WISE-PaaS platform. WISE-PaaS not only provides a wealth of functions and services enabling users to have plenty of flexibility for future functional development, but also offers multiple package options allowing users to select an appropriate server, memory, and database according to actual application requirements. Users can purchase additional items at a later date as their needs change. WISE-PaaS provides backup configuration and failure mechanisms so for example, the primary database and secondary database configured by the system are in synchronization at any time. If a node gets damaged, the system will start a new node and re-synchronize the database to ensure data consistency for stable system operation. 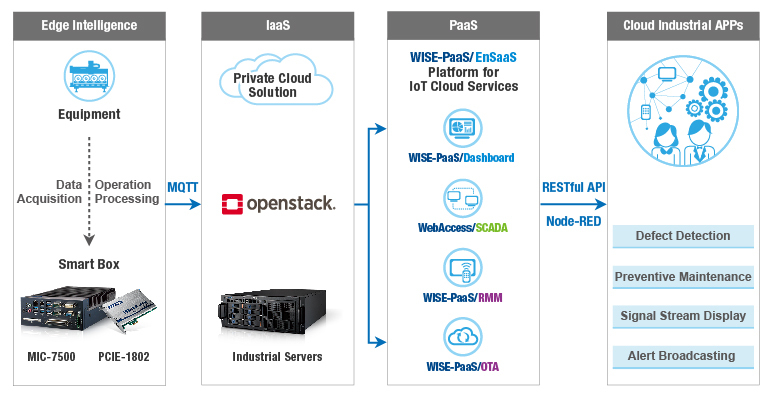 WISE-PaaS/EnSaaS is a platform for delivering IoT cloud services. It supports various databases such as InfluxDB, MongoDB, and PostgreSQL, and machine learning analysis tools R, Python, TensorFlow, and Caffe, plus RESTful APIs and Node-RED. 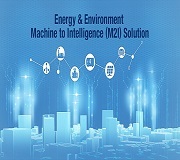 Such features allowed engineers at the steel company to easily design monitoring and management apps and establish predictive models for big data analysis in order to realize real-time monitoring and preventive diagnosis of equipment. 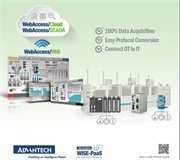 WebAccess/SCADA and WISE-PaaS/RMM centrally manage equipment and devices at the ground and edge. While equipment vibration status in the cold-rolled workshop and status of the data acquisition/edge devices could be faithfully displayed on the monitoring screen. WebAccess/SCADA and WISE-PaaS/RMM will also actively broadcast warning messages when abnormal events occur and notify equipment maintenance staff via email and SMS. In terms of data visualization, users can create their own dashboards by using the WISE-PaaS/Dashboard tool to visually present data in the WISE-PaaS platform database. Through various high readability charts, management staff at the steel company could clearly grasp the operating status of any edge device, abnormal alarms, prediction models, and more. WISE-PaaS/OTA remote update service enabled the company to easily deploy predictive models to the designated edge so administrators could easily complete update tasks without going to the site in person. Smart Boxes are intelligent edge devices that integrate a PCIE-1802 data acquisition card into the MIC-7500 industrial computer for data acquisition at the edge and operations processing on the ground. In addition to obtaining equipment vibration data through the PCI Express data acquisition card, the system also made good use of MIC-7500’s high performance to perform predictive maintenance. For instance, pre-installing smart boxes to run edge-side inference can accelerate the reaction of abnormal events. Or, utilizing smart boxes to train individual equipment helps find where improvements need to be made. Cloud computing is an important key element to make big data analysis successful, but the prerequisite is to have a complete cloud platform system do more with less effort. 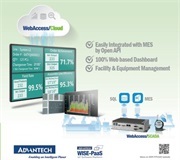 Advantech has a wide range of product lines to provide all kinds of solutions from edge-to-cloud to meet any customer requirements (including various software products in the WISE-PaaS platform, as well as IoT devices, industrial computers, edge devices, etc.). Our experienced consultant team is able to offer professional consulting services to help enterprises set up their own private cloud platform system that includes equipment networking, data analysis, machine learning, and other intelligent applications.